Every year for decades now the Miss New Hampshire Organization has accepted a fur coat made from dozens of skinned wild animals from NH trappers and the NH Trappers Association. There are less than 500 trappers in the state of NH, mostly men, and trapped animals can be bludgeoned, drowned or suffocated. This fur coat acceptance is an antiquated tradition and does not reflect modern times and trends. Today in 2019 there is irrefutable proof that these animals suffer in these traps and can be tortured by trappers. Proof that is provided by the trappers themselves through the videos, pictures and comments they post! There are major cities today in the US and around the world that have banned the sale of fur, and many states are on the way to banning trapping by the cruel methods still used here in New Hampshire. Large upscale fashion designers have gone fur-free as well. 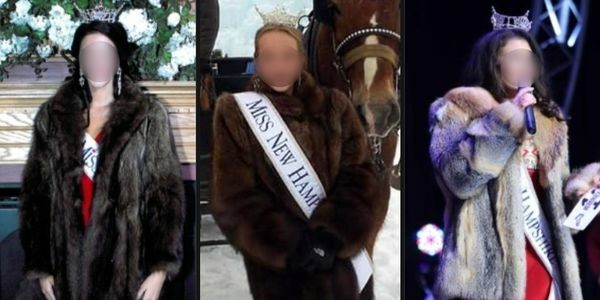 It is time that the Miss New Hampshire Organization and indeed Miss America's as well, takes a stand against cruelty to animals and says NO to this fur coat! These young women are supposed to reflect today's society and trends. They should show independence, compassion, and caring towards animals. By staying stuck in the past and accepting a fur coat made from tortured animals, instead it shows a regressive stance by this organization. Miss New Hampshire, please take a stand against this fur coat and stand up for the innocent animals that are our precious wildlife here in NH! In doing so this organization will come out of a bygone era and reflect modern times.